The so-called Green Mausoleum is located in the city of Bursa, in the northwest of our mystery country, across the Sea of Marmara from the country’s largest and most famous city. Bursa was the first capital of the Ottoman Empire and the Green Mausoleum is the tomb of the fifth Ottoman sultan Mehmed I. The city is known for its Ottoman architecture, including a number of beautiful mosques. 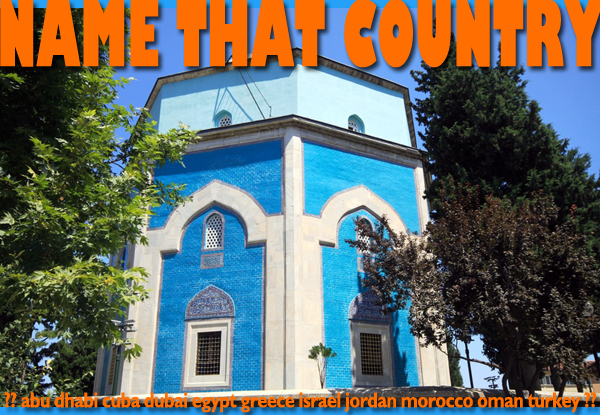 This entry was posted in name that country quiz, Turkey and tagged bursa, sea of marmara, Turkey, turkey tours by yalla2013. Bookmark the permalink.